Indian art has a rich and vibrant lineage which dates all the way back to the 3rd millennium BC. Indian art includes religious influences from a variety of religions, including Hinduism, Buddhism, Jainism, and Islam. In particular, Indian stone sculptures have withstood the test of time and survive today intact to tell fascinating stories of deities, myths,cartierpose.me and archetypes that are more wild and unlimited in scope than our modern minds can imagine. Indian sculpture, although rigorous in technique, is often less beholden to puritanical ideals held by Western culture and is therefore more free and imaginative in terms of the figurative forms and hybrids that Indian artisans could create. The history of Indian art spans multiple time periods, but one of the most fascinating consistent conceptual threads is the paradoxical use of stone - the harshest of all materials - to sculpt a multiplicity of forms that are soft, fluid, feminine, and supple, full of dynamic curvature and structure in form, and equally dynamic in their mythical and storytelling scope. These stone pieces were most often created for intended use as part of a much larger architectural framework that would form the structural frame for temples designed to worship a multiplicity of deities with a vast, expansive variety of characteristics and powers. The history of Indian religion is abundant and flexible, encompassing gods in all forms: feminine, masculine, multi-gendered, animal, human-animal hybrids, animal-animal chimeras, and beyond. Another very strong and consistent theme in Indian art is that of the feminine goddess and fertility, and there is a vast history of art in literature, painting, and sculpture, depicting a variety of female goddesses, with an emphasis on sensuality and fertility. The north Indian Maurya Empire flourished from 322 BC to 185 BC, and at its maximum extent controlled all of the sub-continent except the extreme south. 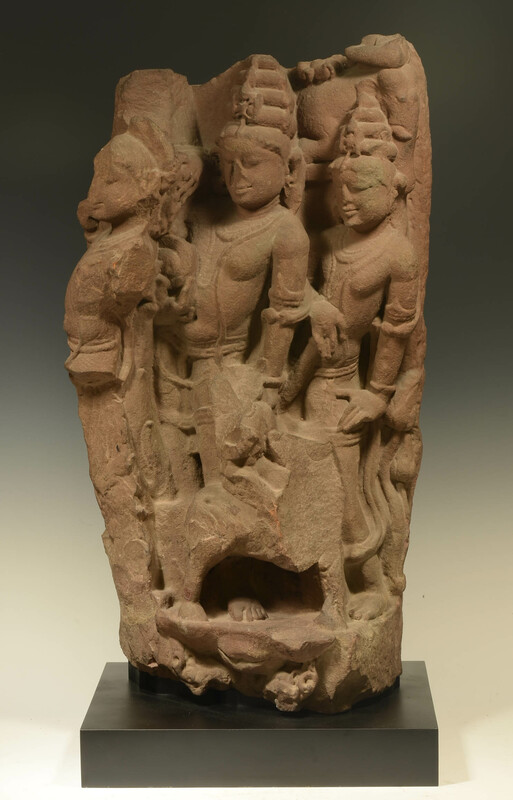 Mauryan culture introduced stone monumental sculpture to India, though probably drew greatly on existing Indian traditions in wood, as well as influences from Ancient Persia. The emperor Ashoka adopted Buddhism and patronized several large shrines at key sites from the life of the Buddha. The most famous surviving sculptures from this time period are the large animals at the Pillars of Ashoka, which showed a confident and boldly mature style. The famous detached Lion Capital of Ashoka, with four animals, was adopted as the official Emblem of India after Indian independence. Buddhist art began in the period after the Mauryans. Large quantities of exquisitely intact sculpture survives from some key sites from this time periods such as Sanchi, Bharhut and Amaravati. Stone stupas, or Buddhist shrines, were surrounded by ceremonial fences with four profusely carved ornamental gateways facing the cardinal directions. The walls of the stupas were decorated with reliefs, mostly illustrating the lives of the Buddha. Gradually life-size figures were sculpted, initially in deep relief, but then free-standing. During this time period, Hindu and Jain religions influenced art making, as well as Buddhism. Buddhism developed an increasing emphasis on statues of the Buddha, which greatly influenced later Hindu and Jain religious figurative art, which were also influenced by the Greco-Buddhist art of the centuries after the conquests of Alexander the Great. This fusion developed in the far North-west of India, especially in Gandhara in modern Afghanistan and Pakistan. The Buddhist Empire spread from Central Asia to include northern India in the early centuries BC, perpetuating the tradition of Buddhist sculpture across the globe. Meanwhile, Greek and possibly Roman traders traveling along the Silk Road through India and Asia, and once can see the Greco-Roman influence on Indian artisans at this time. Gandara art is one of the most distinctive and intriguing styles of Buddhist visual art, specifically with regard to Buddhist figurative sculpture.The Gandara style originated in the area that is now known as Pakistan, but at the time (1st century AD through 7th century BC) was dominated by Buddhist philosophy and rulership. The style is a compelling mixture that is Greco-Roman in nature, due to the influence of Greek artisans and traders passing through India during this time period, but also retains the innate characteristics of Asian Buddhist art. The resulting sculptural forms display a unique mix between Eastern and Western styles, combining the fluidity and curvature standard in Indian figurative art with the linear, mathematical, classically oriented sculptural techniques derived from Greek and Roman traditions. Once can see evidence of this everywhere throughout the form of the Buddha as evidenced in a variety of repeating sculptural forms. Gandaran Buddha sculptures will often retain the original characteristics of Indian Buddhas such as a meditative posture, a peaceful expression, and curved stylized facial structure, but fused with Greco-Roman characteristics such as a perfectly linear robe with repeating triangular lines forming a classically harmonic composition. Many Greco-Roman traditions, such as sculptures of cherubs, garlands, Tritons, etc, were incorporated into Indian sculpture, either literally, or they were stylistically re-interpreted into Indian gods and goddesses. Gandaran sculptures possess a unique color that comes from the materials they were crafted from – often gray blue mica schist and green phyllite, which gives them an austere, serene, calm nature. (Although many of the original sculptures may have been painted with vivid colors, which have been removed by time and the elements). The Gupta period is most widely known as the classic peak of Indian art for all the major religious groups. Surviving works from this era are almost all religious sculptures. The period saw the emergence of the iconic carved stone deity in Hindu art, as well as the Buddha figure and Jain tirthankara figures, often on a very large scale. The two artistic and cultural centers of this time period were were Mathura and Gandhara, the latter the center of Greco-Buddhist art. The Gupta period was a golden age of classical Hinduism. Hindu temples ranged in style from simple to complex, some with plans involving multiple shikaras (towers) and mandapas (halls) . Inscriptions on the Pillars of Ashoka mention coexistence of the northern kingdoms with the triumvirate of Chola, Chera and Pandya Tamil dynasties, situated south of the Vindhya mountains. The medieval period witnessed the rise and fall of these kingdoms, in conjunction with other kingdoms in the area. It is during the decline and resurgence of these kingdoms that Hinduism was renewed. The Khaujuarho monuments are recognized as a UNESCO World Heritage Site. These temples contain sculptures that depict twisted bodies of men and women and shed light on cultural and religious practices in Medieval India. The male and female forms depicted on these temples are indicative of the lavish display of free-flowing sensuality and sexuality and can often be found in Indian religion and culture and is of much curiosity to Western art historians. Hinduism is both pantheistic (it equates God with the universe) and polytheistic (populated with myriad gods and goddesses who personify aspects of the one true God) - allowing individuals an infinite number of ways to worship. Brahma - the creator. He periodically creates and re-creates the universe, in a cyclical fashion, according to the Hindu belief that time is cyclical. Vishnu - Th god that maintains the order and harmony of in the universe, which is periodically created by Brahma and periodically destroyed by Shiva to prepare for the next creation. Vishnu is considered a divine, sustaining life-force that pervades the universe. Shiva - the destroyer. He must destroy the universe at the end of each cycle. The power to destroy is considered by Hindus to be regenerative and powerful, and not necessarily negative but rather a part of the growth process. Ganesha - Shiva’s son. He has an elephant head, and he is considered the Remover of Obstacles. Most Hindu households have a picture or statue of this god as he represents good luck and prosperity. Krishna - the teacher of the sacred scripture of the Bhagavad Gita and the friend and mentor of prince Arjuna in the epic the Mahabharata. Lakshmi - the goddess of good fortune, wealth, and well-being. As the consort of Vishnu, she plays a role in every incarnation. Hanuman - the monkey king and devoted servant. He is featured in the Hindu epic Ramayana. He earned his path to deification by performing feats of strength, devotion, and courage while helping Rama (an avatar of Vishnu). Parvati - the Hindu goddess of fertility, love and devotion; as well as of divine strength and power. She is the gentle and nurturing aspect of the Hindu goddess Shakti and one of the central deities of the Goddess-oriented Shakta sect.